In case you were wondering, Steve and I did manage to make nice after the coffee/missed train fiasco in York. It ended up being a good day after all! As mentioned in an earlier post, we found ourselves on Islay as it was the only western isle that had room for us. Our timing was bad in that we decided to travel to this part of Scotland during the start of the high season, and high season means that travel plans must be made well in advance. However, part of our philosophy on this Grand Tour is to not plan too much, to go with the flow, see where the wind takes us. The wind and the travel gods decided that Islay would be our next stop and we couldn’t have asked for a better temporary home on this mostly treeless and windswept isle of malts. Both of us had heard of Islay, vaguely knew its location on a map, were familiar with some of the malt whiskies from here but had never entertained visiting. 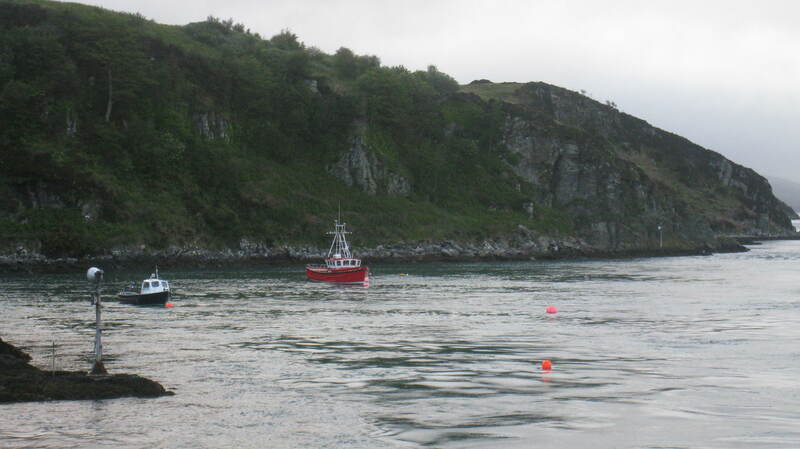 It is not an easy place to get to, which may deter most people from even considering coming here and rather opt for the more easily accessible Mull, Skye or Arran. 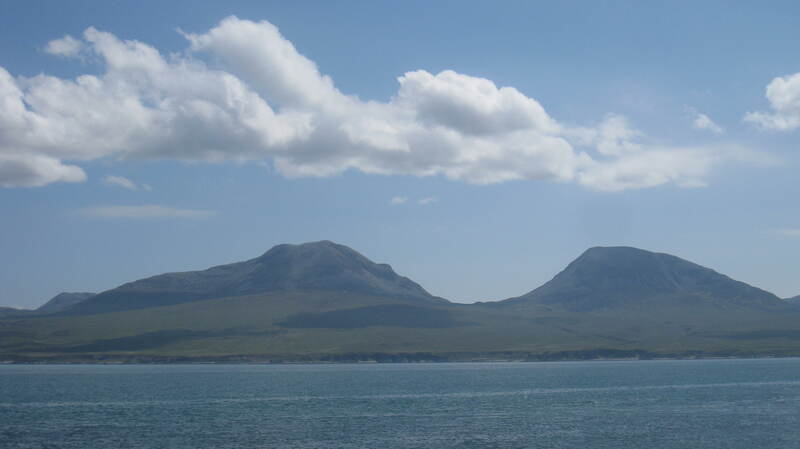 If one does come here, it is usually for the whisky, as there are eight distilleries on the island (nine if you include the one on Jura, a five-minute ferry ride away): Bunnahabhain and Caol Ila on the east coast, Bruichladdich and Kilchomen on the west coast, Bowmore in the center, Laphroaig, Lagavulin and Ardbeg on the southern coast. (Steve is writing up a review of our distillery tours and tastings – stay tuned for that.) What also draws people is the hiking, as there a several trails, some well-worn, others quite treacherous, but all with spectacular views of the water. And the people here are delightful, save for a few tourist-weary ones who were still friendly but at a lower register. Islay enchanted us, so much so that we extended our stay here by two days (the upcoming rugby tournament wouldn’t allow us to extend longer). The highlights (minus the distillery tours and tastings as Steve will cover that), broken into chapters should you get bored, are below. View of Colonsay from the ferry. Finally calm waters! 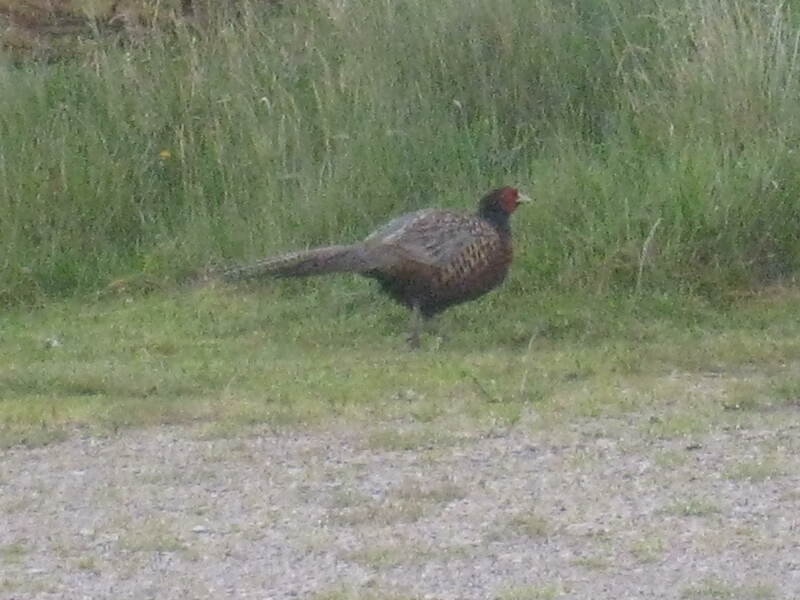 who liked to walk through the yard and announce his presence early (very) in the morning. From South Fork we enjoyed a cocktail or two on the verandah (Dougie and Mary got me hooked on gin and tonics, a drink I previously never cared for) most evenings, prepared meals in the fully-stocked kitchen and ate them on the long twelve-person table, researched Islay’s history and poured over OS maps to identify the best hiking trails, and sat by the evening fire – we had two fire places at our disposal – fueled by peat provided by the property manager. Now we learned a great deal about peat and its importance on the island, originally as the basic source of fuel and later the reason for the signature flavor of Islay’s malts. In order for peat to do its magic with malts – i.e. smoke – it needs to be damp. The peat we had was dried out, the equivalent of charcoal, but was stubborn to the lighter until Steve managed to rustle up some kindling from the property and create a perfect fire for the chilly night (yes, it took him over an hour to start it and the living room filled up with smoke so thick that the smoke detectors went off and my clothes, hair and skin absorbed the peaty odors, but by god, he was determined to have a fire – not a quitter this guy!) At least it kept the midge away, that pesky gnat-sized little brother to the more plodding mosquito. We couldn’t help but think of our good friends in Minnesota, New York and San Francisco and what a perfect place to meet and get together over good food, good drink and great stories. And no bites. The Kildalton Cross, or Another Way to Get Stoned– This is one of my favorite things on Islay. The Kildalton Cross, a Celtic ringed cross of the Iona School carved in the 700s, stands in the churchyard of the defunct and derelict Kildalton Chapel on the southern part of the island, about 6 miles east of Ardbeg distillery. The fact that such a cross stands in this particular churchyard indicates that this parish was once an important seat of the early Celtic Christian church. It is a beautiful example of early medieval stone carving technique and still boasts ornate flora and faint but perceptible biblical scenes, such as the Madonna and child and Cain killing Abel. But what astounded me most is that this beautiful and rare cross is outside. OUTSIDE! Exposed to the harsh elements and not in a museum or at least under some sort of cover. It is remarkable that the details are still able to be seen despite its exposure and I couldn’t stop exclaiming to Steve how something should be done to preserve this cross and isn’t outrageous that no one seems to care about it and don’t these people know what a glorious piece of early Celtic Christianity this is and someone somewhere ought to be flogged over it!! Yet, despite my initial rancor, I realized the Kildalton Cross was intended for this churchyard, its home for 1,300 years, and it deserves to stay here and not in a museum, for pilgrims and visitors to see, enjoy, and marvel at its existence. 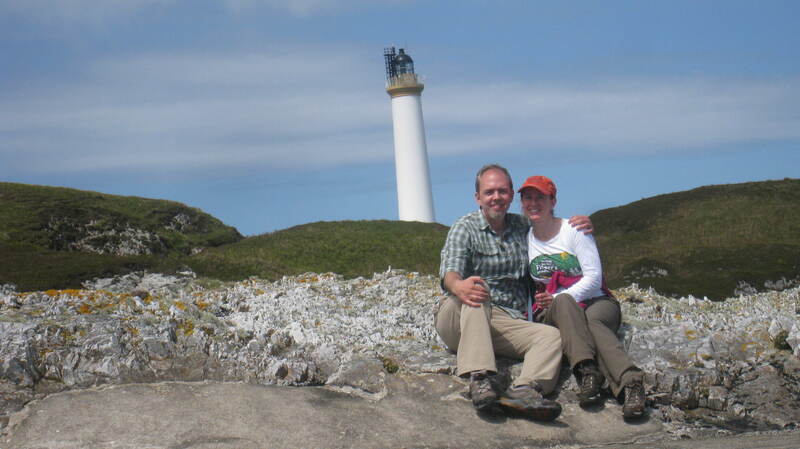 Hike from Bunnahabhain to Rhuvaal Lighthouse, and back, or What To Do If You Get Mud in Your Shoe– Along the northeast coast of Islay is a hiking trail connecting the Bunnahabhain distillery to the Rhuvaal Lighthouse. We decided to tackle this 9-mile round- trip trek for the views, and for the proverbial carrot at the end that was a tasting at Bunnahabhain. The day we decided to do the hike provided us the best whether that we had on Islay, a fortuitous beginning as this was our second full day there. The trail can be best described as a boggy marsh dotted with rocky hills and ravines, small creeks that we had no choice but to jump over as there was no bridge of any sort, and sandy patches that often belied the quicksand-like substance hiding underneath. How best to navigate such a terrain? I followed Steve most of the way, mimicking his quick-stepping on the grassy mounds in the bog up to higher ground. Several spots called for serious negotiation, as it was not apparent if a step onto seemingly dry land was actually an invitation into a knee-deep bog hole. I made this mistake when I lost track of Steve who seemed to think we were back in a New York City subway rush hour and was moving like a bat out of hell, or a goose on the loose, or whatever cliché makes the most sense here. 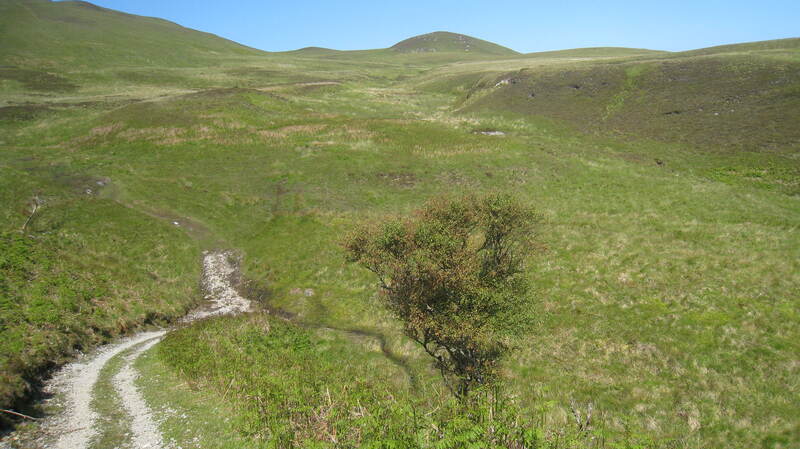 I found myself in an area that was almost all water but still short of a pond, so I decided to gingerly circumvent it, taking the long way around to continue onto the trail, stepping on dryer grassy areas, only to be fooled by a bog hole masquerading as a muddy but firm mound. It took about two seconds for the earth to pull my right leg into a snug but cold cylinder that stopped at my knee. I yelled out for Steve to help me, but heard no response, so I morphed into my own rescuer and managed to extricate myself from the muck, only to discover that the earth decided that it liked my North Face size 8.5 shoe. Looking around for but not finding a stick long and strong enough to reach and grab my shoe, I had no choice but to roll up my sleeve, stretch my arm down and free the shoe from its premature muddy grave. So there I was, with one wet and muddied leg and one wet and muddied arm, a streak of drying mud on my face and dirt spattered about my white hiking T-shirt. And realizing that another couple – the only other people we saw on the trail that day – had seen the whole thing. And said nothing. They simply walked by me with stoic expressions on their faces, gave me a mild nod, and plodded along with the support of fancy titanium walking sticks. 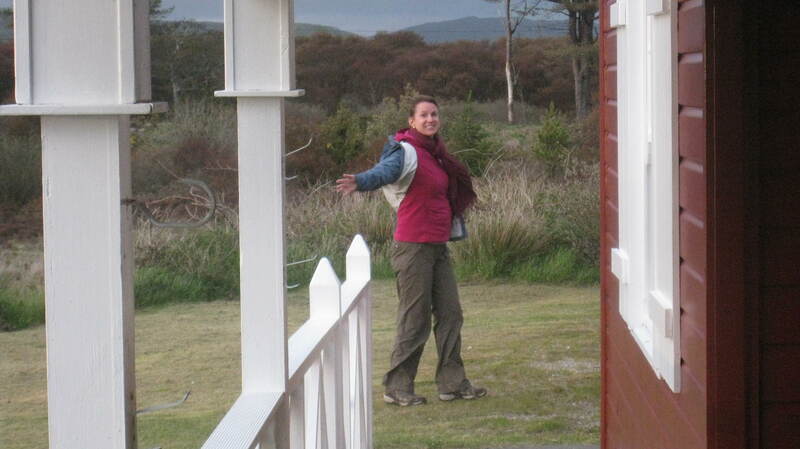 Maybe this is how you walk the boggy trails of Islay. With no emotion. But carrying a big stick. Don’t let Mother Nature smell fear! 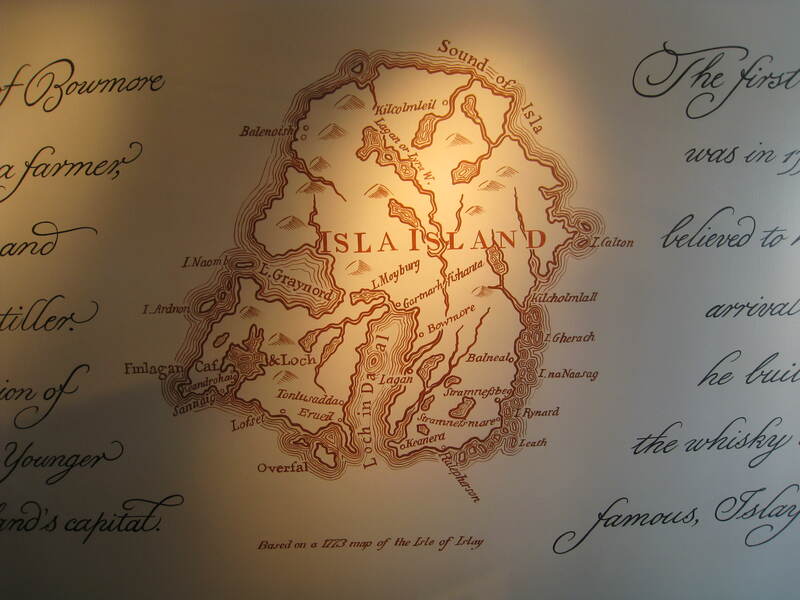 Finlaggan, or Where To Bury Your Wives and Children If You Happen to Be a Lord – If you decide to call yourself Lord of the Isles and rule over territory that includes not only islands but also part of the mainland, then you need a place from which to administer your dominion. Finlaggan, on Loch Finlaggan near Port Askaig, was this very place for the Lords of the Isles, the MacDonalds, who ruled this part of the world from the 1100s until the 1400s. Driving back from our tasting at Bunnahabhain we saw the sign to Finlaggan and decided to make our way there as it was only a few miles away. On the loch itself are several crannogs, or artificial islands created in prehistoric times, two of which served as part of the Lords’ of the Isles administrative center. 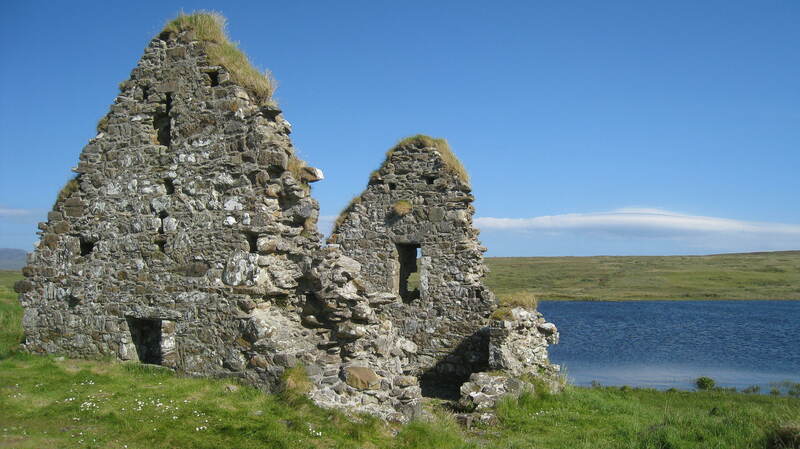 One, Eilean Mor, accessible only by duckboards across a reedy part of the loch, contained the castle, chapel, meeting hall and various stone homes and artisans’ shops catering to the needs of its inhabitants. Further into the loch, the other smaller crannog is believed to have been used for council meetings of the Lords of the Isles and was accessed via a wooden causeway which no longer exists. Today the stone structures that once stood proudly are mere ruins within the lumpy green grass, but we were able to see a few carved gravestones in the space that once contained the chapel. These gravestones are supposed to hold the remains of the wives and children of the Lords’ of the Isles. The Lords themselves were buried on Iona. It is hard to imagine how magnificent this place must have looked in its day or what the politically influential people of the time who visited would have thought of it – Impressed? Ambivalent? Nonplussed? – as there is little to evoke its original allure if there ever was one. Whenever I visit historic “places of interest” such as this I always expect to feel something, to be moved by a connection to the past, whether palpable or metaphysical. I really didn’t feel much of anything except some melancholy knowing that nothing is permanent, life is fleeting, ephemeral, but I feel that way whenever I pass by a cemetery, for example. However, what got me at Finlaggan was seeing the remnants of the causeway connecting Eilean Mor to the smaller Council Island, not the wooden structure, but the stone trail on the sandy bottom, marking the winding causeway trail should the bridge ever need to be drawn up or destroyed. This showed that these early people had some foresight, or perhaps hindsight, in letting future generations know how best to navigate the way across to the other crannog, where best to step if it came down to that, or where to rebuild. It was poignant, a moment where I really did feel a connection to the past. Portnahaven, or The Village that Feng Shui Built – Picture perfect and pretty. Quaint and inviting. Comfortable and charming. 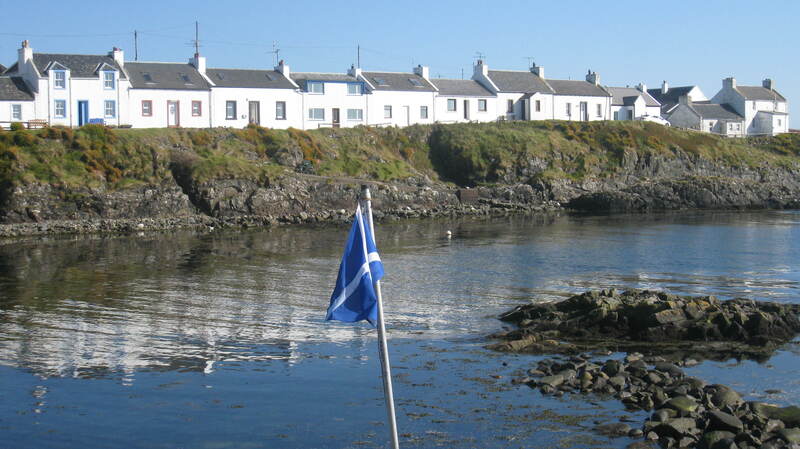 The person who designed the small seaside fishing village of Portnahavan, on the tip of the Rinns, had feng shui in mind as everything about seems to be just so. The winding road from Port Charlotte leads downward to whitewashed cottages that wrap around a lovely calm bay where seals come to play (we saw several bobbing in the water.) 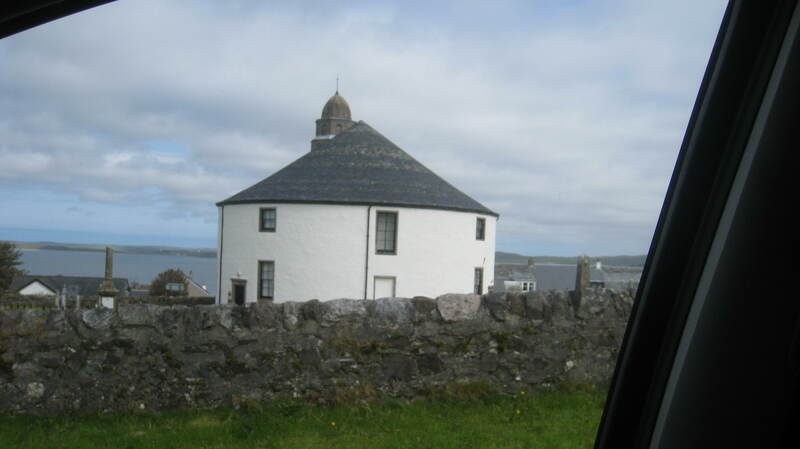 The local church is also whitewashed and serves both Portnahaven and its sister village, Port Wemyss, and still maintains separate entrances for each village which the locals continue to take note of, I am told. There is a bright and airy little local watering hole, the An Tigh Seinnse, that faces the water, and serves brews from Islay Ales. Since the pub happened to be inundated with German tourists (the Germans were all over Islay, and the Scandinavians – maybe for the whisky?) the time we were there, we decided to bring our drinks to the bench next to the water and take in the view. When we first arrived in Portnahaven we had a funny exchange with an officious local lady, who asked Steve to move our car from its parking spot as she said it was too close to the bus stop and the bus would have little room to turn back up to the main road. As Steve was about to move the car, a regular sitting outside the pub whom Steve affectionately calls Yellow Teeth (well, for obvious reasons), gave us a signal to stay where we were, leave the car and ignore the lady as the bus didn’t run the rest of the day. Local lady is known as the village busybody and doesn’t take kindly to tourists taking over her home, and apparently doesn’t like locals making too much noise at the pub in the afternoon either. So Yellow Teeth took great pleasure in thwarting Busy Body’s efforts. This was a mere minor blip in the day and certainly didn’t deter us from enjoying evening’s whispering breeze and watching the seals cavorting in soft waves. 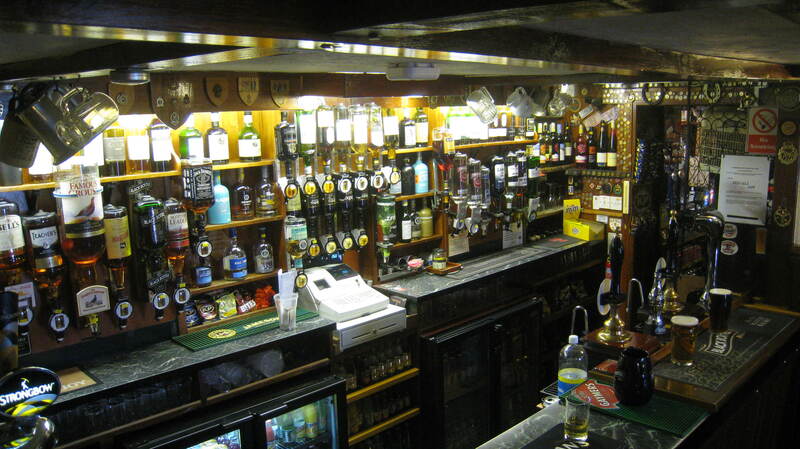 The Ardview, or How To Save Money By Drinking Lots of Whisky – There aren’t many good pubs on Islay. In fact there aren’t many pubs on Islay, period. 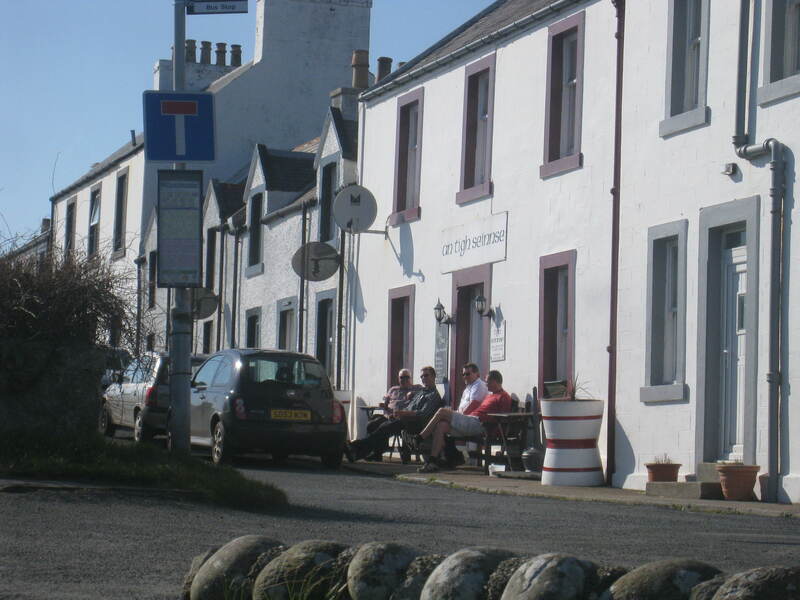 Those that stand out are the An Tigh Seinnse in Portnahaven, The Port Charlotte Hotel in Port Charlotte and, the best of all, for value and selection, The Ardview, in Port Ellen, on the southern part of the island on the way to Laphroaig. The Ardview is about 10 miles from The Red Lodge but is conveniently located near the MacTaggert Community Center, a place we became familiar with as it was the only location that offered relatively reliable WiFi on the island. A compact, two-room pub with little light, the Ardview has an impressive spirit selection and offers all the Islay whiskies, including some experimental malts that you don’t see in most places, such as the Bruichladdich wine-cask finished malts (we tried the Sauternes, the Pomerol and the Pauillac – all delicious) – for cheap. Our friendly bartender, Morag, a lass from Durham in north England, could speak to each malt on offer and was honest about her tastes, what she likes and dislikes, and was able to match us with the flavor profile that we were looking for. Steve and I spent a few evenings here chatting with Morag and meeting some of the regulars who bemoaned that fact that there is nary a pizzeria on the island. 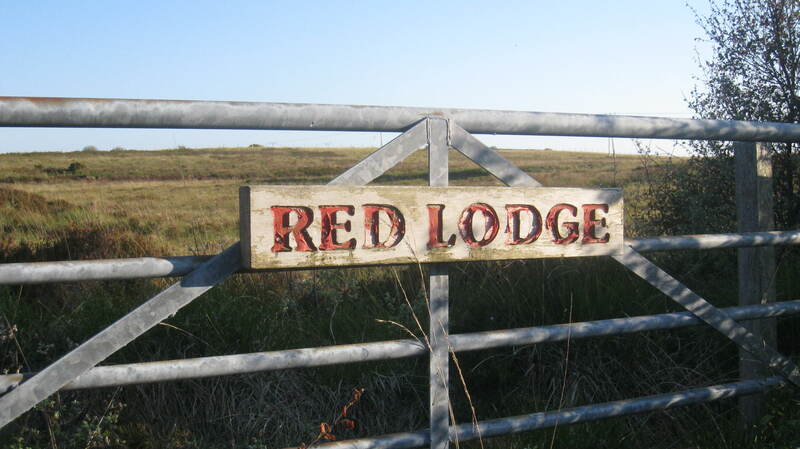 For those of you who are looking for a business opportunity, who love to flip discs of dough in the air and ladle tangy tomato sauce, and who want to get away from the bright lights big city for a slower, sleepier way of life, look no further than Islay. Its people need you! The faces, or Where To See Stewie Griffin – Probably the most striking thing about Islay is its people. Not just the friendly open personalities we encountered, but the faces. The round-shaped faces with high cheekbones and large, usually blue, eyes. Frequently the faces were oval, not oval vertically but horizontally, a la Stewie Griffin on Family Guy minus the pointy ends. I saw these faces in Oban and Jura as well. Perhaps we are seeing the results of centuries of integration between Irish and Norse peoples, the face shapes and bone-structures of Islay’s Celtic and Viking forefathers and mothers persisting to this very day. This is the real connection to the past, live and in living color. 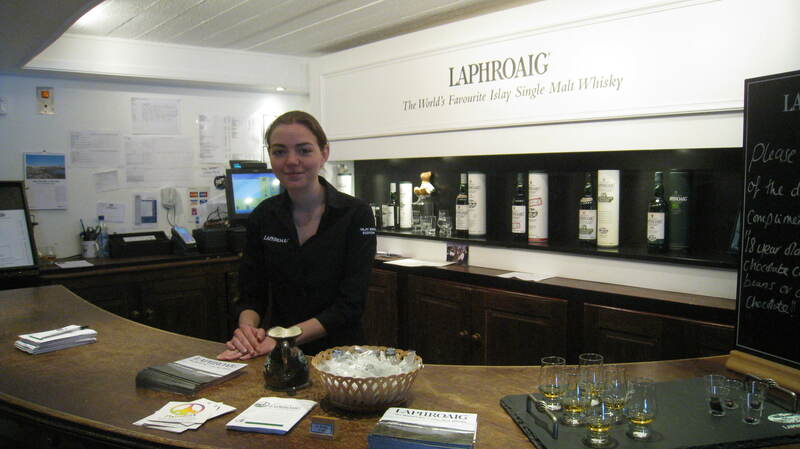 The lovely girl who led us in a special tasting at Laphroaig. She has the unique Western Isles face. Or perhaps I just watch too much TV. Stay Tuned. Isle of Arran, Glasgow revisited, Perth, Inverness and The Black Isle next! The lovely girl who led us in a special tasting at Laphroaid. She has the unique Western Isles face. 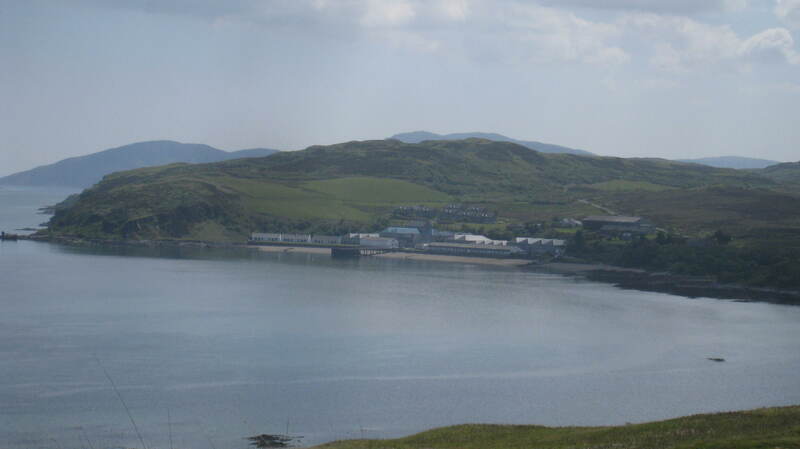 Isle of Jura Distillery. Yes, it was raining that day. Progressive Hebredian Distillers. Don’t you forget it. Thinking outside the box, Bowmore Islay Ale. We had this on our last night. I first heard of the Isle of Islay in the song ‘Westering Home’ in which the singer is returning to his’ain folks in Islay’. 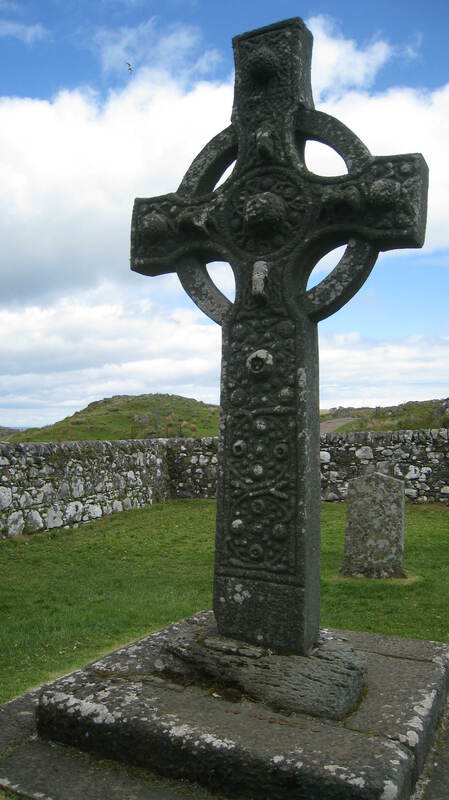 The Kildalton cross is a good example of Celtic stone carving. The western isles were central to Dalriada and enabled Christianity to be spread into Scotland from Iona after St. Columba had established a monastery there. The chief of the clan MacDonald had the title Lord of the Isles until the clan was defeated by the Stewarts so that by the eighteenth century a Stewart had taken over the title. In R.L. Stevenson’s ‘Kidnapped’ the Lord of the Isles was James Stewart.